C. Diff Infections Crop Up Outside Hospitals And Nursing Homes : Shots - Health News Infections with Clostridium difficile can be difficult to treat and life-threatening. Once a problem seen mainly in health care facilities, the infections are now occurring often in the community. Infections with Clostridium difficile can crop up after a round of antibiotics. Most strains are harmless, but tetanus, botulism and gangrene are caused by clostridial species. Vaccination, sanitation and improved medical care have made these infections less common, but one variety has been difficult to contain. Clostridium difficile, or C. diff, can cause diarrhea and a life-threatening infection of the intestines. The bug was associated with nearly 30,000 deaths in 2011. First seen as a problem mainly confined to hospitals and nursing homes, research suggests C. diff rates in the community are on the rise, and that traditional risk factors may no longer tell the whole story. C. diff was discovered in 1935 by scientists in Denver in the intestinal flora of healthy infants. The bacterium was harmless to the infants but proved lethal when injected into rabbits, providing an early clue to its danger. At the same time, scientists in the United Kingdom were pioneering the use of penicillin to treat bacterial infections. The drug's efficacy was near miraculous, but some patients developed severe diarrhea as a side effect. As antibiotics became widely available in the 1950s, this adverse effect became more common. Early researchers speculated that Staphylococcus aureus, a common pathogen, was the cause. The usual treatment for staph is the antibiotic vancomycin, and many patients improved. But the true cause was C. diff — it was a stroke of simple luck that vancomycin is effective against both. In 1974, scientists in Cincinnati discovered a toxin in affected patients' stool, and traced it to C. diff. A surge of interest in C. diff followed, and investigators quickly determined risk factors for the disease. Antibiotic use was already known, but hospitalization emerged as another dominant factor — so much so that C. diff became known almost exclusively as a hospital-acquired infection. 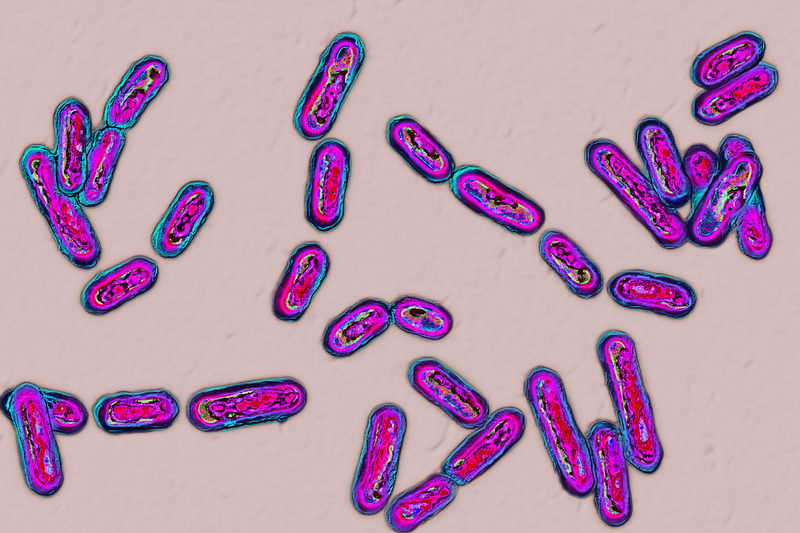 Clostridial species can revert to hardy spores that resist disinfectants, which is why so many infections occurred in hospitals and nursing homes. Health care workers were unknowingly spreading the spores and inoculating patients. Scientists also began to ask why antibiotics triggered the infection. The answer appeared to be simple ecology. In healthy intestines, the sheer diversity of bacteria meant that C. diff couldn't establish a foothold for out-of-control growth. But once a round of antibiotics had purged the normal flora, C. diff could take over. Improved infection control in hospitals began to cut infection rates, but a few studies suggested that the problem might be bigger than anyone realized. In 1991, Australian scientists found that C. diff was responsible for 5.5 percent of outpatient diarrheal infections, and researchers in Boston published additional evidence of community-acquired C. diff in 1994. Subsequent work confirmed the existence of C. diff in the community but suggested that the prevalence was low. Things changed in 2006, when a hospital in North Carolina reported that 35 percent of C. diff infections were occurring outside the hospital, and that only half could have involved antibiotic exposures. A Centers for Disease Control and Prevention investigation, using different methods, found that 20 percent of infections had no recent health care exposure and only half had antibiotic exposure. Work published in 2011 found that 40 percent of all C. diff infections in southern Minnesota were community-associated. Even more concerning, the investigators noted a marked increase over time of community-associated C. diff. The CDC estimated that nearly 350,000 C. diff infections occurred outside of hospitals in 2011, and found that 46 percent were fully community-acquired and 36 percent had no antibiotic exposure. And just last year, researchers in California found that 1 in 10 emergency room patients with diarrhea tested positive for C. diff, and that 40 percent had no risk factors at all. Traditional risk factors — antibiotics and hospitalization — can no longer explain many infections. Scientists have long suspected that antibiotics trigger C. diff infections by disrupting the intestinal microbiome. Could it be that other factors are having a similar effect? Is our microbiome growing more susceptible to these dangerous infections? Dr. Alice Guh, a researcher with the CDC, thinks so. "There's definitely something going on," she says, "but we don't fully understand what." Diet strongly influences the microbiome and could be an element, she says. A recent study found that trehalose, a common food additive, markedly enhances the virulence of C. diff, although Guh cautions that there have been difficulties replicating the findings. Guh thinks some common medications could be involved, too. Popular drugs for heartburn that suppress acid in the stomach are associated with C. diff infections, and have been shown to disrupt the microbiome. And in March a study in Nature evaluated the effects of a thousand non-antibiotic medications on friendly bacteria in the human colon and found that 25 percent had antimicrobial activity. Rising rates of C. diff infection in the community are a major public health concern. But could they be a sign of an even larger problem—that our guts are becoming ever more fragile? Scientists have already uncovered links between changes in the microbiome and a slew of other human diseases. Perhaps C. diff is just a canary in the mine.